"The greatest slaughter of all still waits for us, and it changed everything....Everything." While Babylon 5 was intended to be a five-year story and no more, there were more tales that could be told within its universe. After the series had been canceled after its fourth year and was picked up for the fifth and last year by TNT, that network commissioned some additional TV movies to amplify various aspects of the story. Four of those movies are collected here, together with the restored and revised version of the pilot, which creator J. Michael Straczynski had found quite unsatisfactory as originally aired. That pilot, The Gathering (1993), sometimes aired as a two-part episode, sets up the story of the space station Babylon 5 in 2258 as it is just going operational. Various interstellar races are gathering on the station, including Kosh, the mysterious Vorlon, whom someone immediately attempts to assassinate. But all evidence seems to point to Jeffrey Sinclair (Michael O'Hare), commander of the station. The conflicts between the Centauri and the Narn are set up, as well as the mystery of why the Minbari surrendered to Earth on the verge of complete conquest of our planet. Although the special effects are substantially spruced up and the excised character bits are restored, there are still some problems with the pilot, mostly due to O'Hare's apparent insistence on portraying Sinclair in a way to make Captain Kirk seem modest and subdued. Thankfully, he got much better in season 1, so it's best to watch this episode just as a setup. The alien designs were also not quite perfected, and it's jarring to see them after being used to those worn in the five years of the series proper. The first of the four TNT movies, In the Beginning (1998), starts off late in season five as Londo Mollari (Peter Jurasik) has realized his dreams of power in a manner that he finds highly unsatisfactory. To while away his time, he narrates the tale of the Earth-Minbari war for some small Centuari children, allowing one to consider it to fall chronologically either late in season 5 or even before the pilot. But it's best not to watch it first, even though it's a prequel, because it reveals the secrets behind many mysteries carefully built up in the first four seasons. Furthermore, many things that would seem nonsensical to a new viewer would have deep resonance to a viewer who has followed the story for four years. Straczynski proves his mastery of form and structure in this prequel, which ties in beautifully with the highly-recommended tie-in novels by Peter David, the Legions of Fire. The cohesion between the various aspects of the story is truly remarkable and enjoyable. Thirdspace (1998) is the first of the truly independent movies in the series. Things take a truly Lovecraftian turn as Susan Ivanova (Claudia Christian) finds a mysterious giant artifact in hyperspace. Towed to the Babylon 5 station, the artifact begins to drain power and soon it becomes clear that it forms a gate to a third kind of space, permitting travel even faster than through hyperspace. But what unknown dark gods may dwell on the other side, waiting for the gate to open on ours? Shari Belafonte guest stars as Dr. Elizabeth Trent, an obsessed xenoarchaeologist. Telepath Lyta Alexander (Patricia Tallman) gets to really shine here in a difficult semi-mad role. Despite an intense and highly successful buildup to a horrific climax, the resolution is pretty lame and disappointing. For chronology buffs, this movie would fall in between the fourth season episodes Into the Fire and Moments of Transition. The Soul Hunters, who capture the soul of notable personages at the moment of death, had been introduced early in the first season and seldom mentioned again. But it's an interesting concept that's taken to its logical conclusions in The River of Souls (1998). Archaeologist (why are archaeologists always responsible for things turning bad? Was Straczynski beaten up by one in childhood?) Robert Bryson (Ian McShane) stumbles across a Soul Hunter storage chamber and swipes a large orb containing a billion souls from a doomed planet. Meeting Michael Garibaldi (Jerry Doyle) on Babylon 5 to get funding for his Life Eternal project, Bryson falls under the spell of the souls. Meanwhile, a Soul Hunter (Martin Sheen) comes to the station to retrieve his prize and will stop at nothing to get it back. The B story features trouble on the station in the form of an unlicensed holo-brothel, leaving Captain Elizabeth Lochley (Tracy Scoggins) with her hands more than full. The script is thoughtful and provocative, and also quite humorous at times, marking one of the best moments in the series. Scoggins' character had frequently been somewhat dispensable during the series, but gets to play a vital role in the proceedings here. Sheen as always does an excellent job, portraying the Soul Hunter's increasing grasp of human ways by his steadily improving English through the story, which must have been difficult to accomplish when shooting out of sequence. In chronology, the story takes place in mid-2263, which would place it six months or so after the penultimate episode of Season 5. In 1999 the spinoff series Crusade would make a brief 13-episode run before cancellation. The movie A Call to Arms (1999) was used to set up the situation in that series, by using the familiar B5 characters and settings as a jumping-off point. Taking place five years after the Interstellar Alliance was established (i.e., about four years after the previous movie), President John Sheridan (Bruce Boxleitner) is working with Garibaldi to initiate a new fleet of destroyers, starting with the Excalibur. But a series of visions leads him to commandeer the ship and take it into deep space, where he finds that the Drakh, unrepentant servants of the Shadows, have a planet-killing device that they mean to use on the Earth. The Technomages, who had been introduced back in the first season, make a reappearance here, as they influence matters and set the story in motion. The transition to the new series is symbolized by the replacement of Christopher Franke's music by the more percussive and techno score by Evan Chen. The story is well-done and a reasonably good groundwork for the lamentably short spinoff. Image Transfer Review: The Gathering is presented in its original full frame, while the other four films show up in anamorphic widescreen. The pilot and the prequel had been issued on a flipper disc back in 2001, but the use of RSDL discs and increased bitrates, as well as improved transfers, make an upgrade worth the trouble. The CGI shots remain rather soft and a little murky, but that's inherent in the source material. The live action contains plenty of fine detail and texture, as well as good color and deep blacks. There's minor ringing visible on occasion during high-contrast sequences, but otherwise there's little in the way of artifacting. Audio Transfer Review: The 5.1 audio has a nice broad soundstage, with active surrounds. Low bass is frequently powerful when appropriate, such as during spacecraft flight sequences and explosions. It's quite clear and clean, without significant problems of any kind. Extras Review: Each and every film has a short (about four-minute) introduction with creator J. Michael Straczynski and other cast and crew. These give a snapshot of what was intended, with information that is greatly amplified in the full-length commentaries that are also present for all. Straczynski is a good talker who is thoughtful about his own writing, and he shows up on every track, dominating most of them. Other cast and crew members are also along for the ride on the commentary tracks. That for Thirdspace is more entertaining than most, with the cast clearly having a good time getting together to chat about the movie. The River of Souls commentary has a few dead spots, but otherwise is reasonably good. Finally, disc 5 includes an 8m:37s featurette on Creating the Future, as the crew tries to explain how they reasoned things might be 250 years in the future, as well as their explanations of hyperspace and weaponry. The extras are all worthwhile and definitely interesting for the fan. The menus seem to have a mastering problem; they play haltingly on my Sony and shut down completely on a Toshiba player, but hitting play will send you directly into the film so it's only a mild annoyance. 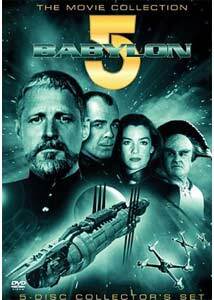 Five movies set in the world of Babylon 5 both set up and expand upon that universe in effective and memorable ways. The transfers are significantly upgraded, and the commentaries are always interesting.